Looking for a way to celebrate the end of 2017? Grand Velas Los Cabos announces Jesse Tyler Ferguson, one of the stars of Modern Family, will act as master of ceremonies of its star-studded New Year’s Eve party. Taking place on the resort’s oceanfront, open-air terrace, the party will also feature performances from American Idol stars Justin Guarini, Kimberly Caldwell, and Melinda Doolittle before a fireworks display to ring in the new year. Inclusive of premium open bar, an eight-course dinner overseen by the resort’s Executive Chef Juan Licerio Alcala, creator of the world’s most expensive taco, will also be part of the event. Menu highlights include foie gras terrine with pistachios and black truffle, lump blue crab salad with grapefruit zest, and Chilean sea bass on an open face ravioli with artichoke puree and champagne beluga caviar. For the main course, there’s steak with lobster bathed in smoked butter, corn grits, endive braised bison sauce and Madeira sauce. Desserts include a Manchego cheesecake and chocolate and rum cannelle. 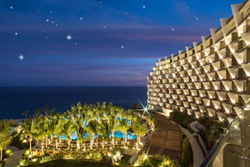 This event is included in the nightly rate for guests staying at Grand Velas Los Cabos. Resort rates for the New Years Holiday start at $895 per person per night in double occupancy. Grand Velas’ all-inclusive rate includes luxury suite accommodations, a la carte gourmet meals at a variety of specialty restaurants, premium branded beverages, 24-hour in-suite service, fitness center, nightly entertainment, tax and gratuities, and more. For reservations or additional information, please call 1-888-407-4869 or visit http://loscabos.grandvelas.com. The new Grand Velas Los Cabos on Mexico’s Baja Peninsula is the fifth property of Velas Resorts. Located between Cabo San Lucas and San Jose del Cabo, the $150 million beachfront property offers the next generation of all-inclusive amenities and facilities with dramatic ocean views and unique spaces infusing every area of the resort. All 304 ocean view suites are over 1,180 sq. ft. with private terraces and some personal plunge pools while duplex wellness suites have designated wellness amenities and insuite juice bars. Grand Velas Los Cabos features five gourmet restaurants with an extensive beverage program and wine based features inspired by the proximity to the region producing Mexico’s fine wines. A staff ratio of 3 to 1; 16,370 sq. ft. convention center with the capability for 20 breakout rooms; 35,000 sq. ft. Leading Spa with 16 treatment rooms and hydrotherapy facility; three pools; and pool and beach concierges are available. Rounding out the list of amenities and services are a Technogym Fitness Center with personal trainers, exercise programs, yoga, Pilates and meditation; recreational activities program; separate teens’ and kids’ club facilities and activities program; 24-hour personalized butler concierge service; and 24-hour in-suite service. Opening soon, a gallery of contemporary art will continue the company’s commitment to bringing the art, fashion and culture of Mexico to guests. The curved, half-moon design of the hotel catches eyes along the corridor with an iconic grand entrance that’s open air, three stories high and over 300 ft. above sea level. All of this beachfront, just 35 minutes from the Los Cabos International Airport which directly services over 40 destinations in the United States, Canada and Latin America. Velas Resorts are operated by Eduardo Vela Ruiz, founder and president of Velas Resorts, with brother Juan Vela by his side, vice president of Velas Resorts. For reservations or additional information, please call 1-888-407-4869 or visit http://loscabos.grandvelas.com.